Castleford Tigers boss Daryl Powell criticised the video referee system brought into Super League this year after it appeared to cost his team victory for the second time this season in last week’s game against Huddersfield Giants. Under a ruling brought in this season referees on the pitch give their indication before passing try decisions “upstairs” and sufficient evidence is then needed to overturn their initial call. Under this rule the Tigers’ Denny Solomona was denied a try at Catalans as he was deemed offside when TV replays indicated he was not, but could not prove it conclusively. Cas went on to lose by one point and they lost 24-16 to Huddersfield when two contentious “tries” were awarded against them. 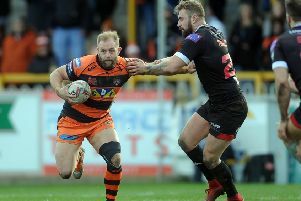 Replays showed Craig Huby lost the ball over the line for the Giants’ first try and Eorl Crabtree was just short with the winning score, but referee Richard Silverwood indicated try on both occasions and video referees Ben Thaler and Steve Ganson declined the chance to overturn the decisions. “I disagree with the new system because it makes it probably impossible for video referees,” said Powell. “On the first of the try decisions the referee goes and asks his tough judge, so he tells him whether it’s a try or not and he’s not in a great position so what’s the point? “I don’t think he was in a great position for the last one and he makes a call on that. He can’t see it. That makes a difference on what’s called. He was short and it was clear he was short, I thought. “We had a try disallowed at Catalans earlier in the year, which cost us two points, which I think was determined by that call. “I think there’s too many decisions being made when the people that are making the initial decision can’t see and they are guessing. “There’s too much guess work going on. “Now you have video referees and they are saying we’ll allow you to guess first before we have a look at it. Sometimes it’s difficult to see. “I think if you didn’t have the referee making that call they would have said he (Crabtree) was short there. Powell said it was hard to make your grievances known to the powers that be. He added: “I’ve been through all of that and it’s a waste of time. Nothing changes, it’s absolutely pointless and I have just got to get on with it. “It’s not good enough, but that’s the way it is. “I can’t really be honest and say what I want to say, but it’s obvious some of the decisions that were made were tough. “Having said that there’s some areas we need to fix up. “We gave away too many errors and penalties and conceded some soft tries.